Wherever you’re travelling from, you can use Gary & Nuala’s Guide to Las Vegas and Beyond to make sure your holiday in the Las Vegas area is memorable, for all the right reasons. It just takes some inside knowledge and a little planning. This book will supply the first – it’s up to you to do the rest. If this is going to be your first visit, then you may not want to go too far, as you will probably be exploring the Strip (the main resort area of Las Vegas) and taking a few day trips to see the main sights of the region, such as the Hoover Dam and the Grand Canyon. If you’ve been to the area before, then maybe you’re aiming to see a little less of the bright lights and the noisy casinos and a little more of the fascinating states of Nevada, Arizona, Utah and California. 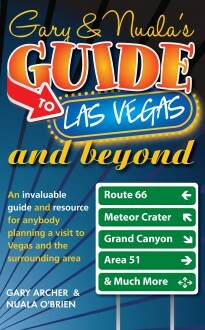 Everything you’ll read in the pages of Gary & Nuala’s Guide to Las Vegas and Beyond has been gathered from personal experience over 15 years of visits to the Las Vegas area.